Shirley Temple may be in her 80s now, but for a four-year stretch from 1935 to 1938 she was Hollywood's biggest box-office draw every year. She pulled in a special Academy Award for "her outstanding contribution to screen entertainment during the year 1934" when she was just six years old, and her career really took off after that. Here are five things you might not know about the adorable screen icon. There are few things tastier for a kid than a non-alcoholic cocktail like the Shirley Temple, a refreshing concoction of grenadine and lemon-lime soda garnished with a maraschino cherry. What does the drink have to do with the child star, though? The Royal Hawaiian Resort in Waikiki, one of Temple's favorite haunts at the height of her fame, claimed to have invented the drink and named it in honor of the hotel's frequent customer during the 1930s. Like most any famous foodstuff, the Royal Hawaiian's claim of creating the drink is debated, though; Hollywood's legendary Brown Derby restaurant maintained that it invented the drink during the same time period. While the drink's origins are murky, Temple is clearly protective of the drink that bears her name. In 1988 a California company tried to market Shirley T. Sparkling Soda. The former child star took umbrage at what she felt was the misappropriation of her name and told the New York Times, "I will fight it like a tigress. All a celebrity has is their name. " The soda maker argued that the name Shirley Temple had become a generic term for the drink, but Temple still took the company to court, the second time she'd had to go through the legal system to squash a soda company's attempts to use her name. The lead role in The Wizard of Ozpropelled Judy Garland to stardom, but it could have gone to a more established star in Temple. Producer Arthur Freed met with Temple in 1938 to discuss the possibility of having her headline the picture, but since Temple was starting to lose her childish looks, he allegedly said, "First we lose the baby fat. " According to a later memoir by Temple, Freed then exposed himself to her. Needless to say, she ended up not taking the part. When Graham Greene was a young writer, he earned a little money by writing film reviews for the British magazine Night and Day. In a 1937 review of Temple's film Wee Willie Winkie Green wrote, "Her admirers—middle-aged men and clergymen—respond to her dubious coquetry, to the sight of her well-shaped and desirable little body, packed with enormous vitality, only because the safety curtain of story and dialogue drops between their intelligence and their desire." Pretty biting hatchet piece on a nine-year-old. Temple's representatives immediately went after Greene and the publishers of Night and Day. They sued the writer and publishers for libel; their claim was successful to the tune of $12,000 in damages. The lawsuit might have had broader literary implications than anyone could have known at the time. Greene left the U.K. to travel in Mexico following the flap, which led some biographers to speculate that he got the heck out of Dodge to avoid being prosecuted and potentially imprisoned for criminal libel. If Greene was indeed fleeing from the law, he made the most of his journey. He turned his experiences in Mexico into the novel most readers consider his masterpiece, The Power and the Glory. Temple was undoubtedly a great actor for such a young child, but it didn't hurt that she usually had a head full of perfect curls when she stepped in front of the camera. As you might expect, giving a preteen such a meticulous hairdo was no small task. Before she turned in for bed each night, her mother had to set her hair in 56 carefully planned curls. Temple hardly fits the stereotype of the washed-up child star. Although she might not have been a box office draw as an adult, she had quite a bit of staying power as a political appointee. Richard Nixon made Temple the United States Representative to the United Nations, and she later served as U.S. Ambassador to Ghana under Gerald Ford. She served in the State Department under Ronald Reagan and also held the post of Ambassador to Czechoslovakia under George H.W. Bush. Temple's foray into electoral politics didn't go quite so smoothly, though. In 1967 she ran for the House of Representatives as a Republican candidate in California but lost out to longtime Congressman Pete McCloskey by around 19,000 votes. By that point, Temple had shed her cuddly former image; her opponents agreed that she was a "hawk" when it came to the Vietnam War. Lloyd's of London insured her for $25,000 with two stipulations: that she did not take up arms during war or get injured while intoxicated. She later said she stopped believing in Santa Claus when she was six. 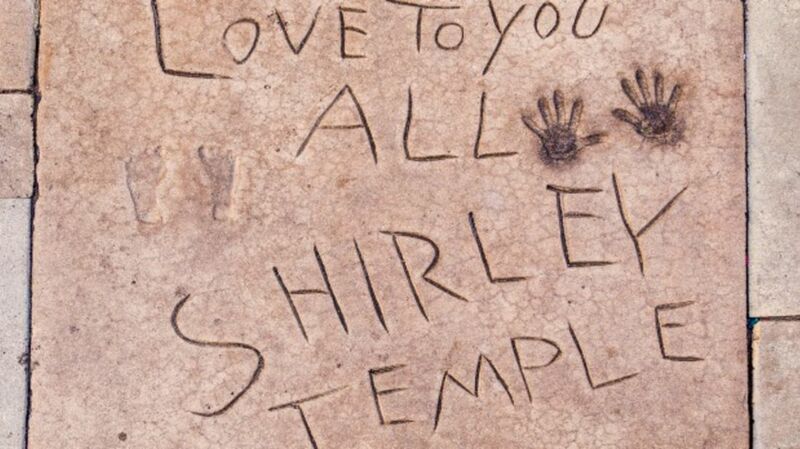 Her mother took her to a department store to meet Kris Kringle, and the store's St. Nick asked for Temple's autograph. When she was just six years old she was already earning over $1,000 a week. During her run at the top she raked in over $3 million. She appears on the cover of Sgt Pepper's Lonely Hearts Club Band. See if you can find her! '5 Things You Didn't Know About...' appears every Friday. If there's someone you'd like to see profiled, leave us a comment. You can read the previous installments here.